Robin Standefer and Stephen Alesch, the duo behind the buzzy Roman and Williams design studio and recipients of the 2017 WSJ. Design Innovator Award, have opened up a new flagship store on 53 Howard Street in New York City’s Soho neighborhood. You may recognize their work at their design feats like The Boom Boom Room at the Standard Highline, the Ace Hotels, and the historic Chicago Athletic Association Hotel. The new 7,000-square-foot store called Roman and Williams GUILD NY carries the studio’s Founding Collection, a line of furniture, lighting and accessories as well as items collected from workshops or craftspeople from around the globe. Plus! The store also includes a flower shop by Emily Thompson Flowers and a café called La Mercerie, which is helmed by chef Marie-Aude Rose, and is a partnership with Stephen Starr of Starr Restaurants (of Le Coucou, The Clocktower, Morimoto and Buddakan fame). Expect the latter to be the hottest reservation in town once it’s up and running for full service in mid-January. The store also includes a flower shop by Emily Thompson Flowers and a café called La Mercerie, which is helmed by chef Marie-Aude Rose and is a partnership with Stephen Starr of Starr Restaurants (of Le Coucou, The Clocktower, Morimoto and Buddakan fame). Expect the latter to be the hottest reservation in town once it’s up and running for full service in mid-January. 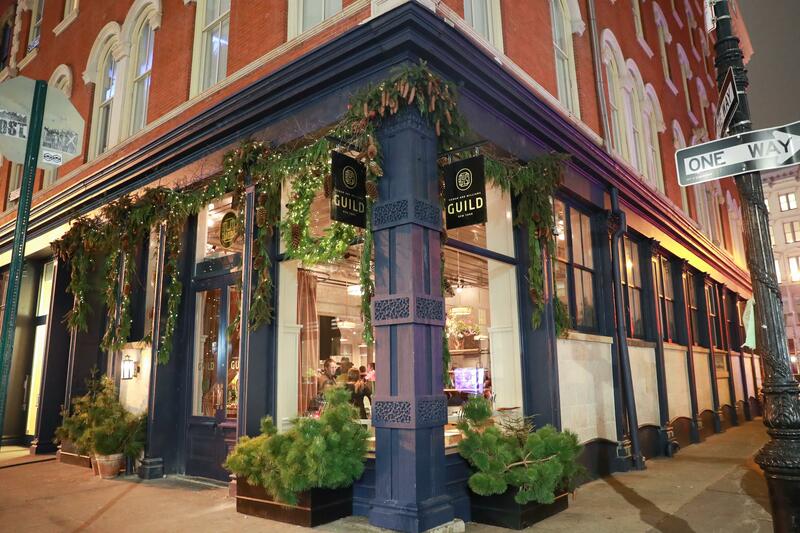 To celebrate the opening, the GUILD held a bash at the new store last night with notable guests like Bill Powers, Sean MacPherson, Rachel Hruska MacPherson, Inez van Lamsweerde, Vinoodh Matadin, Kim Gordon, Maria Cornejo, Athena Calderone, Cynthia Rowley, and more.